"There is always an easy solution to every human problem – neat, plausible, and wrong." The Sequel is the forthcoming (2019) film about the vision, legacy and influence of the late Dr. David Fleming, author of Lean Logic: A Dictionary for the Future and How to Survive It. Above is one of the taster clips, which have gone viral, viewed over 4.5 million times to date! Shaun and the director of the film - Peter Armstrong of Empathy Media - are working closely on this project. The film features contributions from several luminaries inspired by Fleming's work, from Helena Norberg-Hodge and Rob Hopkins to Roger Scruton and Jonathon Porritt. And Bullfrog Films are the global distributors. ... Dedicated blog Updates continue via the film's dedicated blog. 09.11.2018 Preview release Exclusive preview release for educational institutions and grassroots groups. 28.07.2018 Bullfrog Films Bullfrog Films sign up as global distributors, and the title and blurb are finalised. 09.05.2018 Film completed The one-hour film is now complete, and shared with potential distributors. 01.12.2017 Viral reception By the start of December there are five taster clips online, receiving millions of views via social media sharing. 17.09.2017 Website launched A dedicated blog and website is launched for the film, in the hope of engaging the wide community of old and new Fleming fans in pulling it together. 04.07.2017 Work on the film begins After initial meetings between Peter and Shaun, we agree to collaborate on the project and get to work sketching out a draft outline, under the working title "The Seed Beneath the Snow". Off the back of the close collaboration on Lean Logic, Chelsea Green Publishing offered Shaun a role as their first Commissioning Editor for the UK/Europe. For both parties this has proved a great fit, with the role's description as follows: "Identifying authors and book projects in line with Chelsea Green's mission: to reverse the destruction of the natural world by challenging the beliefs and practices that are enabling this destruction, and by providing inspirational and practical alternatives that promote sustainable living". Authors and activists doing work that deserves a wider audience, and the editorial team at Chelsea Green Publishing. 06.11.2018 Oil, Power, And War launched Matthieu Auzanneau's Oil, Power, And War is launched in English (a translation and update of Or Noir, the original award-winning book in French). 04.10.2017 Being Salmon, Being Human launched Martin Lee Mueller's Being Salmon, Being Human reaches publication. 05.09.2017 Walking on Lava launched The Dark Mountain Project's Walking on Lava: Selected Works for Uncivilised Times is the first book brought to publication through Shaun's commissioning role. 01.04.2016 Commissioning role officially begins Shaun identifies the first potential book projects and begins learning the ropes in his new role. 24.04.2015 Collaboration first established with Chelsea Green Chelsea Green Publishing sign up to publish both the full Lean Logic (hardback) and Surviving the Future (paperback), with Shaun as editor. 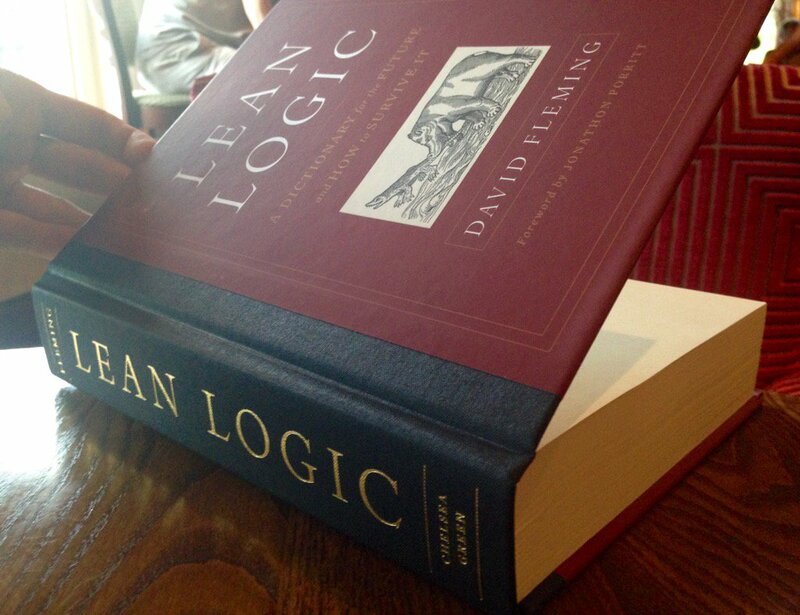 Lean Logic: A Dictionary for the Future and How to Survive It is the astonishing life's work of the late Dr. David Fleming, Shaun's close colleague and friend. Surviving the Future: Culture, Carnival and Capital in the Aftermath of the Market Economy is the more accessible paperback version which Shaun lovingly edited out of the main book. Shaun and a small group of David's former colleagues, friends and family have stewarded his influential work and worked to spread its insights and pleasures to a wider audience. From 2015, Chelsea Green Publishing have been invaluable allies towards this end. ... Dedicated mailing list Updates continue via Shaun's dedicated mailing list for the books. Catch up or subscribe for future updates here. Including the film now in production! 2016... Book tour The extensive book tour begins. Footage from past events and details of future ones here. 08.09.2016 Launch date Both books are officially launched September 8th, with a number of launch events planned for the following months. 09.12.2015 Webpages launched for both books Chelsea Green launch their webpages for both Lean Logic and Surviving the Future. 29.11.2015 Fifth anniversary of David Fleming's death The cover design and editor's preface for the new, fully-edited Lean Logic are released to commemorate the fifth anniversary of David Fleming's passing. 24.04.2015 Chelsea Green sign up as publishers Chelsea Green Publishing sign up to publish both the full Lean Logic (hardback) and Surviving the Future (paperback), with Shaun as editor. 04.04.2014 Lean Logic extracts feature in Dark Mountain Book Five The fifth Dark Mountain book is published, featuring Shaun's second set of selected extracts from Lean Logic. 18.07.2013 Lean Logic extracts feature in Dark Mountain Book Four The fourth Dark Mountain book is published, featuring Shaun's first set of selected extracts from Lean Logic. 29.09.2012 Work begins on Surviving the Future In light of the brisk sales of the full book, work begins on Surviving the Future, intended as a taster, pulling out key threads from Lean Logic in a more conventional narrative format. 04.08.2011 First reviews received The first reviews of the book start to arrive. 13.07.2011 Lean Logic website launched A dedicated website is launched for the self-published book. 07.07.2011 Lean Logic self-published Lean Logic is self-published by David's friends and family in a hardback first edition of 736 pages, just as David left it, typos and all. 29.11.2010 RIP David Fleming David dies as he is nearing the end of preparations for the publication of his masterwork, the product of thirty years of dedicated craft. The Ecological Land Co-operative exists to provide affordable opportunities for new ecologically beneficial projects and smallholdings to find land. Shaun was a key member of the co-op's board from 2012, as they won planning permission for their first site and then raised over £300,000 in community shares to drive forward their plan to deliver 25 new ecological smallholdings by 2020. He stepped down as Chair in 2015, but remains an enthusiastic member. The ELC secured planning permission for its first site, Greenham Reach, after a long battle, culminating in a 2013 public inquiry. In the process, we received over sixty official letters of support, including from the Soil Association, the Campaign for Real Farming, the Transition Network, the Permaculture Association, the Devon Wildlife Trust, Food Policy Professor Tim Lang and other academics, Jonathon Porritt, Zac Goldsmith MP, John Hemming MP and Caroline Lucas MP, as well as established organic smallholders and local residents. The Ecological Land Co-operative works alongside the likes of Chapter 7, The Land magazine, Landmatters and Lammas in the struggle to reclaim people's right to live on and work with the land. See also this blog post, setting that struggle in context. ... Updates continue on ELC website Our growing ELC staff team now has a dedicated news page, where more recent updates can be found. Oct 2013 Site infrastructure developing, in preparation for 2014 growing season The selected holders of the three plots move caravans on to the site to allow them to work on site infrastructure, tree planting etc. A beautiful shared barn with 20,000 litres of rainwater collection capacity is also now complete. 04.04.2013 Planning appeal successful Inspector Jessica Graham grants planning permission for the Greenham Reach project. More details available here. 01.02.2013 Article in Transition Free Press Shaun has an article on the ELC in the first edition of Transition Free Press. 31.01.2013 Appeal inquiry concludes Our three-day public inquiry was closed by Inspector Jessica Graham. Verdict expected after 27th March - our report here. 15.11.2012 Appeal inquiry dates confirmed Our public inquiry will begin on the 29th January 2013 and is expected to last for 3 days. We and the Council must submit all documentation by early January. 01.11.2012 Article in Permaculture magazine Shaun's article exploring the ELC's story to date published in Permaculture magazine (later expanded and republished in Country Smallholding). 04.10.2012 Appeal application approved Our appeal application is validated by the Planning Inspectorate. We now await the setting of a date for the appeal. 01.08.2012 Shaun's first blog on the ELC published by LILI Blog introducing the ELC and its reasons for existing published on the Low-Impact Living Initiative blog. 16.06.2012 Shaun joins the board Shaun is elected to the ELC's board at the 2012 AGM. 06.06.2012 Planning application rejected Mid Devon District Council's planning committee reject the ELC's application, despite recommendations for approval from both the Council planning officers and the local Parish Council. The ELC will appeal. More details here. 10.01.2012 Council application received Mid Devon District Council acknowledge receipt of the ELC's planning application for three independent smallholdings at Greenham Reach. 18.04.2011 Patrick Whitefield permaculture course Permaculture teacher Patrick Whitefield runs a free two-day course in support of prospective residents. Nov 2010 The ELC's Small is Successful report launched This report examines eight economically viable and highly sustainable smallholdings with land-based businesses on 10 acres or less. It is showcased by Research Council UK as "UK research that will have a profound effect on our future". July 2009 First land purchased - Greenham Reach The Co-op completes on a 22 acre site in Devon, consisting of two arable and two pasture fields. Nov 2007 Ecological Land Co-operative launched The Ecological Land Co-operative is officially registered. Shaun wrote the foreword for The Future We Deserve, a collaborative book project edited by Vinay Gupta, Cat Lupton and Noah Raford. He also contributed one of the one hundred short essays that make up the book, and arranged the contributions of Maria Elvorith (the cover art and a short essay of her own), who passed away during the book's production, and to whom the book is dedicated. Book editors Vinay Gupta, Cat Lupton and Noah Raford and artist, contributor and luminous inspiration Maria Elvorith (1982-2010). 05.03.2012 Hard copies released The Future We Deserve is launched, both for purchase in hardback or softback and as a free download. 16.01.2012 Cover art chosen and foreword completed Shaun completes his foreword. With help from Maria's family, Shaun, Vinay and Cat select an appropriate piece from Maria's portfolio, in line with her excitement at being asked to provide the cover art. 23.08.2010 $2,067 raised and work begins in earnest The crowdfunding drive hits (and exceeds) its $2,000 target just in time. 30.06.2010 Crowdfunding drive begins Crowdfunding drive started via Kickstarter. TEQs has become most commonly known by the names 'carbon rationing' or 'energy rationing', and is under consideration as national policy in a number of countries. Shaun Chamberlin is Managing Director of The Fleming Policy Centre (formerly The Lean Economy Connection) which co-ordinates the coalition promoting the scheme, supporting research and working with Governments to move it towards implementation. Shaun also lead authored a popular peer-reviewed academic paper on TEQs in 2015. Shaun worked closely with Dr. David Fleming, inventor of TEQs and founder of The Lean Economy Connection, from 2006 until his death in 2010. The Fleming Policy Centre now acts as the hub for the campaigning, research and technical communities around the scheme, with the European Resource Cap Coalition a particularly noteworthy ally. ... Updates continue via TEQs website As momentum behind TEQs continues to gather, more recent updates can be found on the TEQs website. To be kept abreast of new developments, join the TEQs mailing list. 03.03.2011 TEQs software team inaugurated We now have a team of volunteers from numerous organisations around the world looking at the possibilities for building and integrating software to run TEQs, with the ultimate aim of the scheme becoming an 'off the shelf' solution for Governments faced with energy crises, or wishing to guarantee emissions reductions. 04.02.2011 Australian University collaborating on trial Shaun has discussions with researchers at Australia&apos;s Southern Cross University, who are leading a project on Norfolk Island, testing the world&apos;s first tradable carbon rationing scheme in a realtively ‘closed system’ island environment. 27.01.2011 World Bank report received A senior energy specialist at the World Bank shares an extensive report on real examples of electricity rationing - both good and bad - providing compelling evidence of both the need for, and the absence of, a thought-through instrument to ensure fair distribution of energy at times of scarcity, and to support managed demand reduction. 26.01.2011 Exceptional media coverage The Parliamentary launch generates extensive media coverage from the likes of the BBC, Time magazine, The Sunday Times, Bloomberg News, The Daily Mail, The Financial Times and many others. Full updated list here. 18.01.2011 Parliamentary TEQs report launch The All Party Parliamentary Group On Peak Oil launch their report into TEQs, with endorsements from John Hemming MP, Caroline Lucas MP, Jeremy Leggett and Shaun. Video footage of all talks, and Q&A, here. 10.01.2011 New TEQs website launched New TEQs website launched to mark the forthcoming release of the Parliamentary report. 30.11.2010 Parliamentary TEQs report launch to go ahead The All Party Parliamentary Group On Peak Oil report launch will go ahead as planned, with Shaun taking David's speaking slot. We feel sure this is what he would have wanted. 29.11.2010 RIP David Fleming David Fleming, inventor of TEQs, unexpectedly passes away while visiting a friend in Amsterdam. The various online tributes and obituaries have been collected here. 25.09.2010 Facebook group A supporter sets up a Facebook group for TEQs. 14.09.2010 Date set for final Parliamentary TEQs report launch All Party Parliamentary Group On Peak Oil report launch set for 10am on Tuesday 18th January 2011, at the House of Commons. 13.09.2010 Climate Policy special issue Yael Parag and Tina Fawcett edit a special Sept 2010 issue of the Climate Policy journal, looking exclusively at ‘personal carbon trading’, including TEQs and PCAs. 01.07.2010 London School of Economics presentation David Fleming and Shaun present on TEQs and Transition Towns to the Complexity Research Group at the London School of Economics. 19.05.2010 Swedish Parliament David Fleming speaks on TEQs at the Swedish Parliament. Extensive 24 minute interview given after the event available here. 03.03.2010 Radio Ecoshock Shaun does a wideranging 25 minute interview with Canada's Radio Ecoshock, covering Transition and the forthcoming All Party Parliamentary Group report into TEQs. 02.01.2010 Guardian Letters Page A supporter has a letter published in the Guardian endorsing TEQs as part of a package of measures. 02.12.2009 Science Museum debate Shaun joins a panel debating carbon trading and offsetting at the Science Museum's Dana Centre, as part of their Cheat Neutral event. 09.11.2009 Environment Agency propose carbon rationing The Chairman of the Environment Agency concludes that "rationing is the fairest and most effective way of meeting Britain&apos;s legally binding targets for cutting greenhouse gas emissions". 10.09.2009 Scottish Parliament Shaun speaks at the Scottish Parliament, as part of the Holyrood 350 campaign. 09.09.2009 IPPR's Plan B? report published The Institute for Public Policy Research's new report concludes that Government should prepare the ground for possible future implementation of TEQs. 12.08.2009 All Party Parliamentary Group report draft released The first draft of our policymakers' report on TEQs is released by the All Party Parliamentary Group on Peak Oil and Gas, arguing that implementation is now an urgent priority. 18.06.2009 Westminster Hall debate on Personal Carbon Trading Tim Yeo MP introduces a Westminster Hall debate on personal carbon trading, following on from the Environmental Audit Committee report and the Government's response. 18.05.2009 Dutch edition of Energy and the Common Purpose published Energieslank Leven met Klimaat Dukaaten: Stapsgewijs minder energieverbruik voor allemaal was translated by Inge Kuipers and Jan van Arkel. 07.05.2009 TEQs discussed in Scottish Parliament Dr. Bill Wilson MSP champions TEQs in the Parliamentary debate on the Climate Change (Scotland) Bill. 01.03.2009 Resurgence article Shaun's article on TEQs published in the March/April 2009 edition of Resurgence magazine. 27.11.2008 Personal Carbon Trading research community gather The UK Energy Research Centre hosted a very productive 2-day workshop bringing together the key research experts active in the field of personal carbon trading. 28.10.2008 Government response to EAC report The Government respond to the Environmental Audit Committee's May 2008 report, reaffirming their interest in TEQs, but refusing to fund further research unless costs can be shown to be lower, or benefits higher, than in DEFRA's flawed pre-feasibility study. 27.09.2008 BBC Radio 4 BBC Radio 4 host an excellent studio discussion on Peak Oil, in which John Hemming MP argues for TEQs. 25.09.2008 APPGOPO report The All Party Parliamentary Group on Peak Oil and Gas invite The Lean Economy Connection to produce a joint report with them on TEQs, to be published in 2011. 17.08.2008 Polly Toynbee article Polly Toynbee endorses TEQs in her Guardian column. 24.07.2008 Sheila McKechnie Awards Shaun shortlisted for the 2008 Sheila McKechnie Environmental Campaigner Award due to his work on TEQs. 16.07.2008 Institute for Public Policy Research (IPPR) The IPPR release the results of their research (parallelling DEFRA's research) into the public acceptability of TEQs, supporting our own earlier conclusions. 03.07.2008 First meeting with Gavin Starks Gavin is the founder of AMEE, a concept explicitly designed to integrate with TEQs, and which could dramatically cut the costs of implementation. 13.06.2008 Transition Towns Rob Hopkins interviews David Fleming for his Transition Culture website, and states that "pressure should be coming from the community level up for (energy) rationing". 30.05.2008 BBC Newsnight David Strahan, author of The Last Oil Shock and TEQs advocate, is interviewed on the BBC's "Newsnight" programme (May 2008). Discussion of TEQs from the two-minute mark. 26.05.2008 Environmental Audit Committee report The Government Environmental Audit Committee release their report into personal carbon trading, agreeing with our opinion that DEFRA is mistaken to delay a full feasibility study of the subject. Full details here. 13.05.2008 All Party Parliamentary Groups Shaun gives a presentation on TEQs to the All Party Parliamentary Group on Peak Oil and Gas and the All Party Parliamentary Group on Climate Change. 09.05.2008 The Lean Economy Connection official response David Fleming and Shaun release the Lean Economy Connection's official response to the DEFRA study, highlighting the shortcomings of the methodology and arguing that delay is ill-advised in the absence of other realistic and effective means for addressing climate change and fuel depletion. 08.05.2008 DEFRA pre-feasibility study into TEQs released DEFRA release their pre-feasibility study into TEQs, which contains much useful research. Unfortunately they also decide not to press ahead immediately with a full feasibility study. 10.03.2008 BBC Newsnight Sian Berry, Stephen Hale and Kenneth Clarke discuss TEQs on Newsnight, after the topic is introduced by Tim Yeo, Chair of the Parliamentary Environemntal Audit Committee. 12.12.2007 Climate Code Red Shaun contributed to the carbon rationing section of the Climate Code Red report produced by the Carbon Equity group in Australia. 13.11.2007 Climate Change - The Solutions Shaun organised "Climate Change - The Solutions" event in conjunction with the World Development Movement. 24.09.2007 Third edition of booklet Third edition of David Fleming's Energy and the Common Purpose booklet on TEQs released, edited by Shaun. 18.07.2007 Zero Carbon Britain The Centre for Alternative Technology and the Public Interest Research Centre launch their Zero Carbon Britain report at Parliament. The report details how Britain could become carbon neutral by 2027 and is built around TEQs. 10.07.2007 DEFRA Advisory Panel Shaun invited onto DEFRA's Personal Carbon Allowances Advisory Group, to review progress in their ongoing 'pre-feasibility study' research programme. 25.06.2007 DEFRA Personal Carbon Allowances Feasibility Workshop DEFRA hold a Personal Carbon Allowances Feasibility workshop, looking at what further research is required before a possible future implementation. 11.06.2007 De Montfort University Funding secured for research partnership with De Montfort University. Work to begin in 2008. 31.05.2007 Evidence submitted on Draft Climate Change Bill David Fleming invited to submit evidence to the Joint Committee on the Draft Climate Change Bill. 14.03.2007 New TEQs website New TEQs website 'soft launched' in collaboration with The Lean Economy Connection. 13.03.2007 History and Policy paper Historian Dr Mark Roodhouse examines wartime rationing and concludes that “the use of taxes alone to control consumption was rejected in the World Wars, and they would not achieve the quick, dramatic cut in carbon consumption that we need now to avert environmental disaster. Tradable carbon rations would have a real impact”. 05.03.2007 TEQs recommended in Australia TEQs submitted to the Australian Prime Ministerial Task Group on Emissions Trading by a former CEO of the Australian Institute of Company Directors, and former Chair of the Australian Greenhouse Office Experts Group on Emissions Trading. 29.01.2007 Second edition of booklet Second edition of David Fleming's Energy and the Common Purpose booklet on TEQs released, edited by Shaun. Shaun authored this book in collaboration with the Transition Network. It was requested by local Transition initiatives in order to provide them with a sense of the context within which their local 'Energy Descent Action Plans' will be implemented. 03.02.2011 Mainland China launch After success in Taiwan, The Transition Timeline is translated again (into Simplified Chinese) for launch in mainland China. 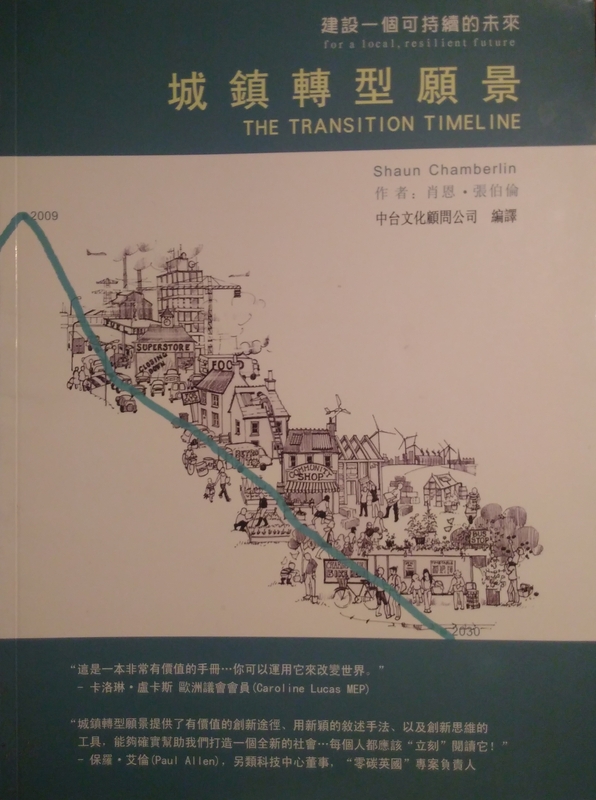 17.11.2010 Translated into Chinese The Transition Timeline translated into Chinese for the Taiwanese market. 13.07.2009 Ways With Words literary festival Shaun discusses his book at the Ways With Words literary festival, as part of a wider speaking tour throughout the remainder of 2009. 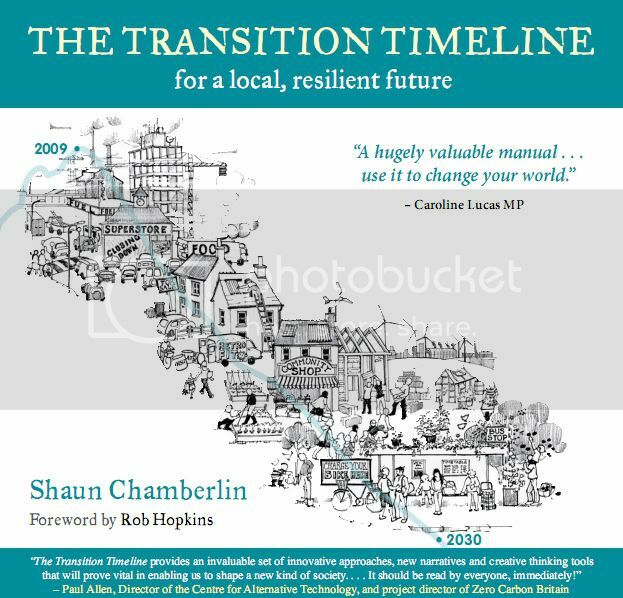 05.03.2009 The Transition Timeline published The Transition Timeline published in both UK and US, and stocked by all major book stores and sellers. 06.01.2009 Publishers agreed Green Books sign up to publish The Transition Timeline, as a followup book to Rob Hopkins' Transition Handbook. Launch date set for March 2009. 26.08.2008 Cultural stories focus added Project refocused on the cultural stories that will determine which of the future scenarios detailed actually come to pass. 11.08.2008 Climate change/peak oil section completed First two parts completed outlining context of UK energy descent. Focus now shifts to detailing the Transition Vision for the UK out to 2027. 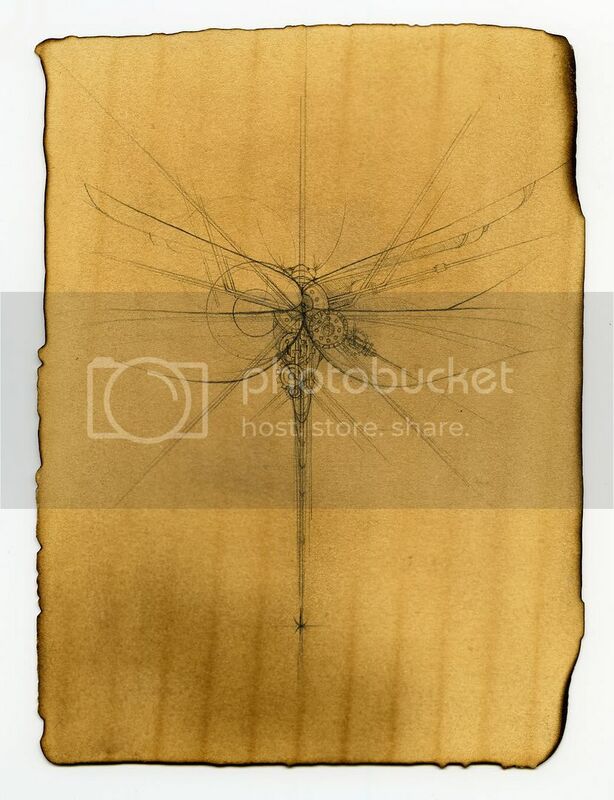 22.05.2008 Online version launched Due to around 60 new individuals wishing to contribute to the development of the project, the draft Timeline document is added to Google Documents, a service which allows invited collaborators to access the latest version of the document at any time. A forum is also set up for the project on the Transition Towns website. 11.04.2008 Transition Conference Presentation on progress so far to the second annual conference of the Transition movement. Much enthusiasm for the concept and desire to help push the project forward. 25.11.2007 Scoping meeting Scoping meeting in Bristol with thirteen of the project contributors listed above. 20.11.2007 First discussion Initial discussion in Totnes with key members of the Transition Towns network to discuss project outline. Shaun is a founder member of the Transition Town Kingston Steering Group. TTK exists to mobilise and facilitate community action in Kingston to respond effectively and positively to climate change and peak oil, and operates according to these governing principles. The Kingston community, including the other five members of the TTK Steering Group. ... Recent events For more recent information, take a look at our Transition Town Kingston website. 30.05.2009 "Visioning the Future" TTK's biggest event yet, with over 250 local residents getting involved in creating positive visions of Kingston's future. 16.02.2009 TTK meets with our local MPs TTK members are invited to Westminster to meet local MPs Ed Davey and Susan Kramer. 09.12.2008 Council approve Sustainable Communities Act Following our petition Kingston Council's Executive approve opting in to the Sustainable Communities Act 2007. 04.12.2008 David Fleming celebration Dr. David Fleming gives a fascinating talk on the importance of celebration to mark six months since our steering group formed. 21.11.2008 Regional Green Champion Dr. Martin Birley follows up his earlier success with the regional Green Champion award. 07.11.2008 Action planning event 50 attendees, who form six action groups to raise awareness of peak oil, climate change and TTK. 31.10.2008 Over 100 signatures on petition TTK collects 102 signatures in three weeks on an online petition asking Kingston Council to 'opt in' to the Sustainable Communities Act. 13.10.2008 Green Champion award Dr. Martin Birley of the TTK Steering Group is awarded the Kingston Green Champion award. 18.09.2008 Guardian interview Feature interview with Shaun about Transition in the Kingston Guardian. 26.08.2008 Granted official status The Transition Network recognise TTK as an official Transition Initiative. 08.08.2008 Kingston Informer article Feature article on TTK in the Kingston Informer. 03.07.2008 Green Guardian Award nomination TTK nominated for the Green Guardian's 'Green project or Group' Award. 09.06.2008 End of Suburbia film screening TTK's first public event with around 30 attendees. 02.06.2008 TTK Steering Group created Inaugural meeting of the TTK Steering Group. 29.05.2008 Kingston Green Radio Five TTK members attend a studio interview for Kingston Green Radio. 26.05.2008 Geodesic dome at Green Fair TTK had a base at the Kingston Green Fair, along with the local permaculture group, to raise local awareness. 21.04.2008 First TTK meeting First informal meeting of Kingston residents interested in starting a Transition Town. Superstruct is the world's first massively multiplayer future forecasting game, in which players collaborate both to envision our future and to invent new ways to ameliorate it. Shaun is one of the five game masters for the project, which was organised by the Institute for the Future (IFTF). Jane McGonigal and Jamais Cascio of the Institute for the Future (IFTF). 19.11.2008 Closing post Closing post for Superstruct posted on Dark Optimism. 14.11.2008 Game ends The official ending of the Superstruct game, although the site will remain open. 31.10.2008 Half way update Update posted at half-way point of the Superstruct game/experiment. 16.10.2008 First weekly update First weekly update on Power Struggle and other Superthreats. 06.10.2008 Game launched Superstruct gamesite goes live and play begins. 22.09.2008 Dark Optimism intro First full introduction to the Superstruct game posted on Dark Optimism. 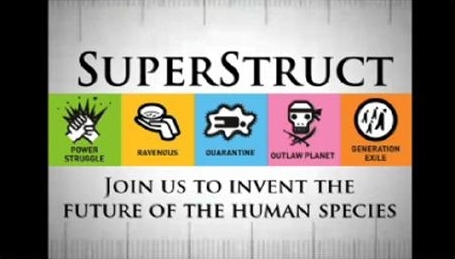 22.08.2008 First videos released The first video relating to each Superthreat is released on the Superstruct website. 08.08.2008 Facebook group launched Facebook group launched by people eager to get playing. 11.08.2008 Shaun to be Power Struggle game master It is announced that Shaun will be the game master for the Power Struggle Superthreat. 08.08.2008 Game website launched www.superstructgame.org teaser page online. 11.07.2008 Further details announced More details of the game are released. 10.07.2008 First information on Superstruct released Jamais Cascio of the Institute for the Future (IFTF) releases the first information on Superstruct.